Join us on Wednesday nights! We practice every Wednesday evening at the Lord of Life Lutheran Church, 13421 Twin Lakes Drive, Clifton, VA. If you like to sing, you will love singing barbershop. For great fun, fellowship, and a real sense of accomplishment, be our guest. Any time is a great time to join us on the risers to see if this is for you. Come join us for one of our weekly meetings and see if barbershop singing is for you. If you like to sing, like to have fun, and want to be part of a great chorus, then the Fairfax Jubil-Aires may be for you! You probably have a lot of questions that need to be answered before you take that first step into our barbershop world. Well, here are the answers to most of them, and if you have others, then please contact our membership chairman, Aaron Watts, and let us know what other information we can provide. Click here to email Aaron or call him at 703-731-2764. Our rehearsals are on Wednesday evenings from 7:30 to 10:00 p.m. at Lord of Life Lutheran Church, 13421 Twin Lakes Dr., Clifton, VA 20124. A schedule is sent to the members ahead of time, so that we all know what is planned for the rehearsal, like what songs we will be rehearsing and whether any special guests or coaches will be there. A typical rehearsal puts us on the risers in formation at 7:30 for warm-ups and other vocal exercises. After that, our director leads us through some songs that we are working on to add to our repertoire or for upcoming performances. Sometimes we work on songs from our repertoire that we haven't sung for a while, too. Halfway through the evening, we have a break, during which time there is usually a fair amount of informal quartet singing. Then we have a short "business" meeting, mostly devoted to announcements, awards, etc. Many times we allot time for what is called "fun-time", where one of the members will present something or have members participate in something funny, instructive or whatever. After that we are back on the risers to rehearse some more, either working on songs or general singing exercises to make sure our tones are matching, we are singing with resonance, in tune, etc. At the end of the evening, the group joins in singing the anthem of the Barbershop Harmony Society, "Keep the Whole World Singing." Beyond the rehearsals, we have varous performances throughout the year, including an annual show, Singing Valentines. and performances at various events and locations in the area. One of the biggest pleasures for the members of the chorus is when we can entertain and bring enjoyment to the people we are singing for. We also have time for parties and other social events, and at least twice a year we participate in contests where we are competing with other choruses. These events are especially enjoyable since it gives us the opportunity to meet and sing with other barbershoppers from other chapters. 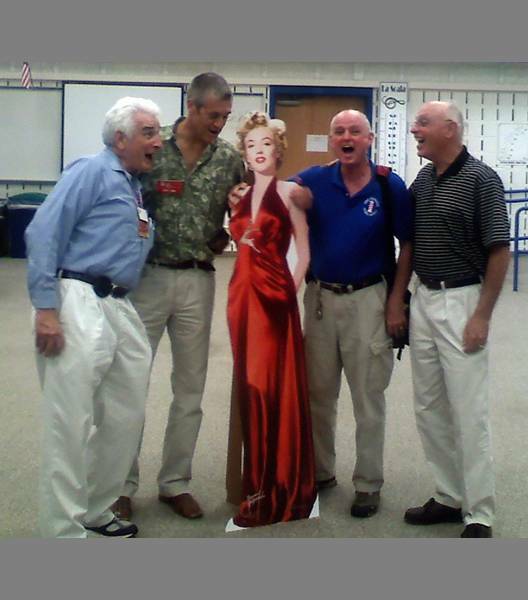 Basically, the Jubil-Aires are men of various ages, many of whom are supported in this hobby by their wives and significant others (the Jubil-Ladies) who love to sing and enjoy the company of others who share their passion for barbershop music. Some are retired and some are not. Some are married and some are not. Some are older and some are younger, but we are all young at heart, especially when we sing. Some of our best friends are fellow Jubil-Aires, and many of us never met before joining the chorus. Some have been barbershop society members for many years and some have just joined. The best way to get to know who we are is to join us for a couple rehearsals and see if this is the right group for you. WHAT QUALIFICATIONS DO I HAVE TO HAVE? WHAT DOES ALL THIS COST ME? Actually, it doesn't cost you anything to come and see if you like singing with the FJA (Fairfax Jubil-Aires). If you decide to join, then you will need to join the Barbershop Harmony Society. Most of the dues money goes to the Barbershop Harmony Society to pay for their programs with youth and other worthwhile efforts. Please contact our membership chairman, Aaron Watts, for dues details. Click here to email Aaron or call him at 703-731-2764. HOW DO I KNOW WHAT PART I SING? Some men know exactly what part they sing, but most don't. Many of our new members are not familiar with what parts there are in a barbershop chorus (or quartet). In most songs, the lead sings the melody (with a range like a second tenor for those more familiar with other types of choruses). The tenor floats above the melody and has a range like a first tenor. Many tenors in barbershop use falsetto to reach the notes they are given to sing. The bass provides the foundation down on the bottom, and the baritone fills in whatever is missing in the chord. Don't worry if you are not sure what part you should sing, because part of our director's job is to help you figure that out. IS IT HARD TO MEMORIZE ALL THE WORDS AND NOTES? Harder for some than for others, but some great methods have been developed by the society to help with that. Even when you don't read music, learning tracks are usually available to listen to, and just the repetition of singing along in the car or wherever will make it easy to learn the songs. Every barbershopper in the country is familiar with 12 songs in a book called the Polecat songs. These are standard barbershop songs that you will want to learn as soon as you can, because once you know your part for these songs, you will be able to walk into any chapter meeting in the country and sing along with their members. Beyond that, the Jubil-Aires have a "repertoire" or group of songs that most members know and that can be used for the appropriate performances. It won't take long to learn those songs either, and for most of them, learning tracks are available. Most new members find that after being on the risers and listening to a song for several times (and maybe looking at the music while the chorus is singing), they are soon singing along. There will always be someone else singing your part who will be willing to stand behind you and sing so that you can hear the part, and that helps, too. Most importantly, as the chorus learns new songs, you will be on the same page as everyone else, learning the song right along with the rest of us. Typically, when a new song is introduced, each section goes to a separate area with a recording of the song where their part is predominant (or louder than the other parts). They will listen to the recording for two or three times; then they will say the words as they listen a couple times; then they will just hit the notes (using short "doots" instead of words) a couple times to make sure they are hitting the correct notes right away; and finally they will sing along several times. By the time the chorus reassembles, most people will be able to sing the song with very little reference to the music. This is a proven method for learning new material, and it is good exercise for the brain!!! BUT I DON'T KNOW ANY OF YOUR MEMBERS. WILL I FEEL WELCOME? You will not only feel welcome, but you will be amazed at how fast you get to know a really great group of guys! You will soon feel like family!